* Mud no longer drains stamina. However, the chance to get rooted while walking through is higher now. * Bandages now heal Poison. If they remove a status they heal 10% of max HP instead of 5%. * New MAGIC MOD (any item type): Lucky. Chance to find extra gold on monsters. * New STARTING PERK Rage. You deal +15% damage when at 50% or lower health. * Bandages now heal HP conditionally - only if they removed a status first. * Support for abilities to have conditionals based on the results of the first effect. For example, remove status -> if statuses were removed, run further effects. Ladies and gentlemen, we've done it! 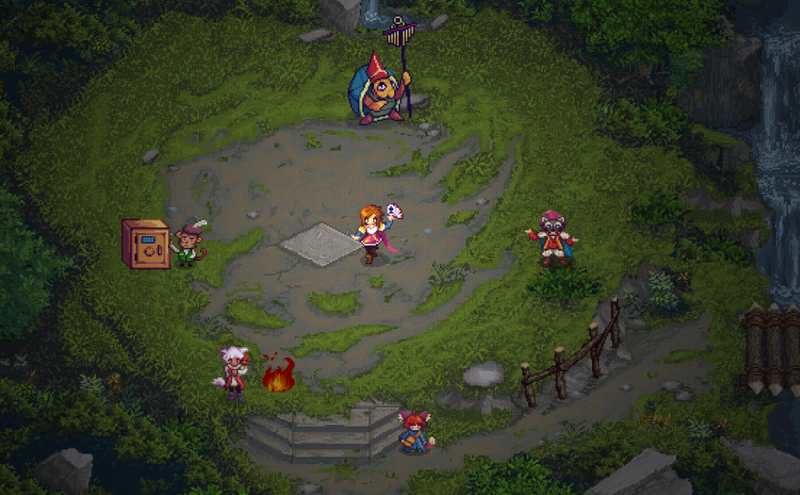 Tangledeep has been fully funded! Now I can ad all that delicious polish, AND, since the Kickstarter isn't over yet, there are more stretch goals (and more awesome polish) ahead. For example, composer Grant Kirkhope (GoldenEye 007, Banjo-Kazooie, Donkey Kong 64, Kingdoms of Amalur: Reckoning, Civilization: Beyond Earth, Yooka-Laylee...) will be joining the project as a guest composer if we can hit the $21k goal. How awesome is that?! Of course, we're not resting on any laurels here - I've been putting every spare minute into Tangledeep to make it better and better. This build is pretty major from a balance and content perspective. Notably, the dungeon is now 20 floors total, and all enemies and loot drops have been rebalanced to compensate for the additional length. That means new monsters have been added, abilities have been changed, HP/damage values tweaked, and new side areas available to explore. My goal is to smooth over the difficulty curve so there is not such a dramatic spike between certain floors, also giving you time to learn enemy behaviors/powers and build up loot. While dungeon expansion is the main thrust of the update there's tons of other great changes and additions too. Check it out! * New Brigand, Sword Dancer, and Floramancer walk animations! * Hand-tuned monster levels and mlvl to player level ratios. Generally speaking, as you level up, it will take longer for a monster to register as less dangerous (and thus give less XP). * Blazing champion mod: Chance to proc their DOT reduced to 50% on hit instead of 100%. Also, the DOT refreshes duration but will not STACK duration. * Significant rework to the dungeon. It has been extended down to 20 floors! Many monsters have been rebalanced, three new ones have been added (see below), and there is a new boss fight. These drastic changes might mean balance gets thrown off, so be sure to let me know how your runs go! * New low-ish level side area: Flooded Temple! * New mid-level side area: Bandit Enclave! * NEW POTION: Brew of Rapidity. Increases your CT gain for a brief time! Action economy! * NEW MONSTER: Crabbit. You'll find these not-so-threatening dudes on the lower levels, but don't get too complacent: if they grab on to you, they won't let go! * NEW MONSTER: Airacudas. A swarm of snapping fish in midair... why not!? Watch out: if they smell blood, they go berserk! * NEW MONSTER: Bandit Spellshaper. This dangerous enemy uses shadow, ice, and acid to ruin your day! * NEW CHAMPION MOD: Blademaster. Summons lots of spinning, moving blades! * Sword Dancer's "Thundering Lion" ability has been remade. Now, when toggled, you will gain an Electric Charge each time you move, at the cost of 5 Energy. You can hold up to 3 charges. Each charge gives you a bonus to Parry, and will be unleashed on your next attack as lightning bolts. (More charges = more damage). This should synergize better with the flowing, movement-heavy gameplay of the Sword Dancer, and fills both an offensive and defensive role. * Jade Beetles no longer have a wind-up charge, but instead, will rush at you with a jump attack. 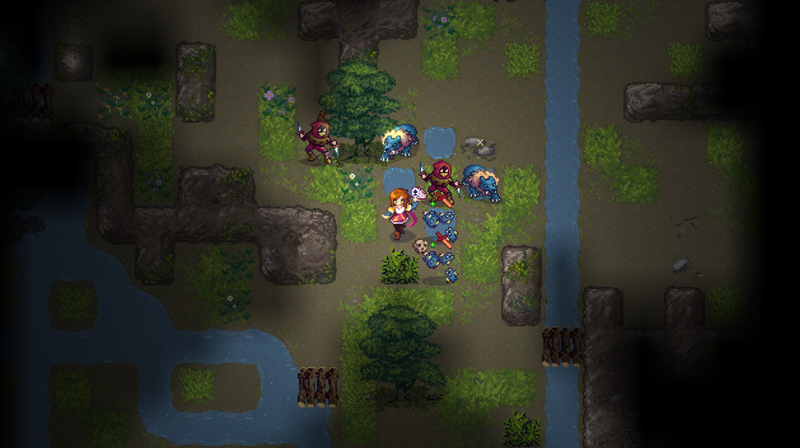 Re: Tangledeep: 16-bit style roguelike dungeon crawler, now FUNDED on Kickstarter! - The new UI feels much better, I think! - I like that hovering over an occupied weapon-bar icon results in the weapon's power being shown--I found it useful and convenient to have that information on-hand. - The bridges crossing the various streams are a welcome addition, providing a means of crossing without paying in stamina. - The animated water is an improvement, I feel. - A suggestion: In the equipment screen, if the player drags a weapon off of the weapon-bar and drops it onto another weapon, swap the latter into the slot from which the former was dragged. - An odd bug: I switched to another window to type something. I then returned to the game--only to find that the mouse-controls no longer worked! The keyboard controls still did, however--and indeed, opening the equipment screen seemed to restore mouse control. - I had an instance in which a set of stairs was hidden behind the leaves of a tree--I only found it via the map, I believe. - It feels difficult to restore stamina compared to energy--and especially compared to health. -- This is perhaps exacerbated by the stamina-draining effect of water--there seems to be no analogue for the other stats. As we approach the Kickstarter campaign's first stretch goal (character portraits!) I've got a new update ready to go! This introduces the rumor system. Rumors are a way to get extra items, JP, XP, and gold, as well as get info about parts of the dungeon you've not yet explored. There are 4 types of rumors to start with, which you can obtain (for a price) in Riverstone Camp. There are also 'conditions' which sometimes appear with rumors, adding extra rewards - but extra challenges too. Aside from this - which took most of my dev time since last build - there are quite a few bug fixes, some balance tweaks, and a key fix that should make the UI more usable at resolutions lower than 1920x1080. Check the full log out below! * Blademaster champion: Spin blades will no longer hit twice in the same turn. Also, they don't double-summon blades anymore. * More fine-tuning over number of champions per floor, and max mods per champion (this can now be set in mapgen data.) Crucially, side areas no longer *automatically* support up to 4-mod champions! * You can no longer use Knight's Shovels on boss maps or in the town. * Fixed game restart bug when you selected "restart with same character"
* New low-level side area: Jelly Grotto. What could possibly be inside? * New champion mod: PULLER. Will randomly pull other monsters into the fray, causing damage if they land near you. * Wow that rumor system. It saves and loads too! * Gorgeous visually expansive art for Riverstone Camp! * Rumors with conditions now give even more rewards. "No Flask" condition gives yet more still. "Damage Taken" has been made more lenient. * The cost to learn a rumor now scales +25g per level, but you also earn more gold rewards. * Turtling and Barrier champions now reflect projectiles when their shields are up, if you fire into the shield! Thanks for the feedback! You CAN left click to move to an adjacent square, right? Just click and you'll move there. No problemo. I can, I believe--and indeed, I perhaps didn't convey very well what I was doing. Outside of combat, I tend to move my character as though it were controlled by a directional key: I point the mouse in the direction in which I want to go, and hold down the "move" key, adjusting the mouse position as called for. This doesn't require that I be clicking on the square beside me--just a square that lies in the right direction. Since movement is turn-based, I still have control over which squares I enter (with occasional errors, I daresay), but don't have to click on each in turn. Unless I'm mistaken, the left-mouse controls don't work quite that way: the choice of tiles is determined by the pathing algorithm, with little input from me aside from selecting the destination. Ooh, this sounds like a rather interesting take on quest-giving! The rumour system adds a fair bit for me: I find it fun to have specific goals to seek out while exploring the dungeon. I also rather like some of the new side-areas; the jelly cave (the proper name of which I forget) was a nice low-level encounter, and the Applewood Grove was a fun little adventure. In the latter, I particularly like that the insects steal fruit--it provides a new incentive to engage with them. The "Blademaster" champion effect is an interesting one! On a similar note, I like the new monsters now available, especially the varieties of slime--their various abilities provide a little extra interest to the combat, I find. - Chicken Dinners seem to have the same price as Turkey Legs, which feels a little off. - I had a case in which the game would not let me cast a materialised, square-shaped shadow invocation. I had 43 Energy and 88 Stamina, I believe. The spell-shape did include some obstructed tiles, but not all were, and I think that I was clicking on a non-wall tile. A fire evocation did work, if I recall correctly. --That said, I think that I may have had some instances of clicks being "ignored" elsewhere, so the issue may have come from that. - Unlike food, potions that heal stats don't seem to display the amount of healing that they provide. - The key-binding for the "rumour" screen doesn't seem to be shown in either the help screen or the "readme" file--although it's possible that I simply missed it! - It seems that sometimes deactivating a spell-shape consumes a turn--is that intended? - Breakable walls hide secret areas, but they seem to be displayed on the map in a colour other than that of normal walls, which can somewhat give them away. That said, they're also distinct in the level, too, so perhaps they're intended to be clearly visible? - A suggestion: In the equipment screen, have item-comparison information show when the player drags one item over another, presuming that the two are compatible. For example, if I have two suits of armour in my equipment (aside from the suit being worn), I might compare the two by dragging one and hovering it over the other. Great feedback, noted all the bugs/inconsistencies, will look into it more. Stamina/Energy are indeed supposed to be limited, but food is (relatively) plentiful - between that and powerups you should be able to use abilities regularly enough. No job can get by right now without a decent amount of physical fighting and I think I like that design because of the variety of weapons, the weapon hotbar for easy switching, and all the possible weapon mods you can have. Stamina/Energy are indeed supposed to be limited, but food is (relatively) plentiful - between that and powerups you should be able to use abilities regularly enough. I did find foodstuffs to be very useful, I will admit. I think that I did feel that I was pressing up against the limits of my gold, but then I seem to recall that I still had food in my inventory when I died, so perhaps I was nevertheless a little too parsimonious with it. No job can get by right now without a decent amount of physical fighting and I think I like that design because of the variety of weapons, the weapon hotbar for easy switching, and all the possible weapon mods you can have. I think that I tend to be frustrated when a game offers a class that appears to be a pure- or near-pure- spellcaster--but then nevertheless expects me to rely primarily on standard weapons. That, however, is a matter of personal taste. OK! This build introduces an all-new job with the most custom ability coding I've done yet... the Gambler may or may not be balanced, but she'll take those monsters for all they're worth! This is a job that relies on high-risk, high-reward playstyles and (of course) some luck too. On the balance side, you can expect a greater challenge from floors 9 and up, as monster damage was not scaling anywhere near enough previously. The aggro/stealth system has been revamped and is ab it less abusable. Recovery abilities have also been scrapped or reworked; there are no longer any jobs who can simply heal themselves on command. Lots more too... see the full log below! * New sparkly effect for even common items to help them pop. All loot should shine. Even meat! * Monster damage + health has increased starting w/ monsters that appear in dungeon floors 9 and up. This means significant damage boosts for some monsters. Let's see how that goes. Watch out! * Brigand's "Sneak Attack", as well as other abilities that require you to be 'out of combat', should now more accurately check to see if you are actually hostile/aggroed to enemies. * GUILE stat now has more of an effect on your chance to crit and parry. * Recovery job abilities have been reworked because they generally have been throwing off game balance. Recovery should come from your Flask, food, and potions - if some jobs have simple self-healing abilities, then restoring Energy suddenly becomes that much more valuable for those specific jobs. Here's what changed. 1. Photosynthesis ability has been altered. This is now a self-buff that improves your damage and defense by 15% if standing near a summoned vine. 2. Floramancers have a new innate passive - when your Summoned Living Vine dies, recover 15% of your max HP. * "Stealth" effects such as the Intimidating perk, Brigand's Smoke Cloud, Light armor and Stealth equipment have all been changed. They no longer reduce the enemy's aggro/sight range. Instead, they reduce the chance an enemy will aggro/notice you if you are within their range. Thus, even with a lot of stealth, you can still get noticed by an aggressive monster if you spend too much time nearby. * Spellshapers have a new innate job passive: Stamina powerups now restore a little Energy too. * New side area: PET SHOPPE (also a wandering merchant). And some new items exclusive to there. * Equipping or unequipping gear with Health, Stamina, or Energy bonuses now only increases your MAX stat and not your current stat. Which means you can't kill yourself unequipping a Hood anymore! Well there sure were a lot of bugs with that last build! Oops! This new one fixes lots of them, plus older bugs that have been around for a long time. I made some deep engine changes to map generation, saving, and loading, so hopefully nothing will break this time? This build also adds a much-requested feature, a healer in town! Percy doesn't do much at the moment other than heal you to full, but that's pretty good, right? Of course, healing isn't free, and it only gets more expensive each time you do it per character level. In other words: you won't pay much earlier on, but as the XP curve slopes upward and you spend more time on each experience level, you won't be able to rely on him as much. * A reluctant new friend has joined Riverstone Camp: Percy, the healer! All loot should shine. Even meat! Well there sure were a lot of bugs with that last build! Oops! Hah, I'm glad that I missed that one, then! Ahh, interesting--that does seem like a neat feature, especially given the scaling! This essential update fixes some map generation issues and other big bugs, while also making key balance tweaks, and adding an all-new map layout style. There are also a bunch of new items, the 2nd boss fight has been redone, and Percy - the turtle healer - can now change your job anytime, and give you temporary 'blessings' too! * The (placeholder) final boss is harder now. * PROBABLY fixed bug where some dungeon levels would have unreachable areas. Let me know if this continues. * New map generation type, currently found on floors 14 and 18... introducing a new environmental hazard: poison atmosphere! Stand in rooms with Purifiers to save yourself! * Percy can now also give you blessings, buffs that can make life in the dungeon easier. Blessing cost is based on your level, and they only tick down while in the dungeon. * NEW FOOD: Briny Fish! Allows you to effortlessly move through water, gaining an extra 5 CT per step. * NEW WEAPON: Sharktooth Axe. A particularly powerful weapon that is less accurate than most, but hits like a truck if it connects. * NEW ACCESSORY: Judo Sash. Grants you the basic unarmed fighting ability of a Budoka. * NEW ACCESSORY: Topaz Earrings. Allows you to absorb incoming lightning damage. * Status effects can be flagged as "dungeon only"
That said, I have some feedback on the previous build. A few of the points that I noted for feedback seem likely to have been fixed--they were a single-tile dungeon on level five, which stopped my progress, and rumour prices not seeming to be as expected, I believe. First of all, I very much like the Floramancer's more-animated sprite; I think that the walk-cycle adds somewhat to the aesthetics of the game. Similarly, I like the new tile for the "Bed of Thorns"; the animation is a nice touch, I think. I also rather like the Spark Staff as a starting weapon: it's different, and it feels appropriately "magical", unlike the fairly basic slingshot that I recall the class previously starting with. -- Come to that, what is the purpose of requiring payment for deposits? The player is already sacrificing access to the weapon in question, or the gold that could be had by selling it. There's also a limitation on how many items may be stored. Why prevent the player from storing things? - The bank's storage functionality doesn't seem to work properly--at least, if I'm understanding it correctly. If I'm not much mistaken, this is what happened: I had one item in the bank. I then deposited another, and performed a save-and-quit. That done, I started the game again and created a new character. Going to the bank, I found the original item present, but not the second. - There seems to still be a large area around the bottom-right UI in which mouse-clicks don't work. - I'm uncertain about the application of the "Cloth Quiver": does it work with weapons like the spear? It refers to "ranged" weapons, and the spear has a range greater than one. I gather that "projectile" weapons are considered to be separate from merely "ranged" weapons, and it would make sense for a quiver to be associated specifically with such as these--but the description isn't clear on this. - In fullscreen (under Windows 8.1), seams seem to appear between tiles when moving. -- Of the tiles that I saw, this only seems to affect water, mud, and wooden bridges. I don't think that I found lava during this run, so I don't know whether it was affected. - Similarly, some sprites seem to "shake" when the camera moves. -- For example, in the camp area, the banker shakes, but the rumour-vendor doesn't. - It seems to be possible to move while the "rumour" screen is visible. - The sprite used for the swinging vines could use a bit more contrast, I feel--I find them a little too easy to miss, I believe. - While having sprites become transparent when overlapping is quite helpful at times, it looks as little odd to me when applied to the player-character standing in front of and overlapping an NPC. - In the bank, I believe that I saw cases in which a deposit would cost more than I had, but in which the text wasn't coloured red. -- It seemed that losing sufficient money did cause at least some of these items to turn red. -- Is it perhaps using the base sale cost of the item, rather than its deposit cost? -- This may stem from the presence of an options file generated by a previous build; I note that the issue disappeared eventually--possibly after restarting the game. - The lowest setting for the "Zoom Scale" doesn't seem to do anything. * For now, the "Ruins" map type has been removed, hopefully fixing any issues related to it (unreachable areas). Don't worry, there are still 6 other map types and counting. Hmm... I think that I may have been using the bank after reloading a save--could that have had an effect? Oh, thinking of which, there may be a minor exploit in the save-game system: as far as I've found, quitting the game via Alt-F4 bypasses the save-system, allowing the player to return to an earlier point in the same run. The new "Ice Daggers" champion mod in action! The dungeon is looking great! * New and animated lava! * Attempted fix for regen flask charges sometimes not being consumed. * Modified version of the Demon Spirit now spawns in the main dungeon, later on! * Monsters can now use buff abilities on other monsters, even AOE buffs and AOE heals! * Trying to attack while disarmed/paralyzed no longer consumes a turn. 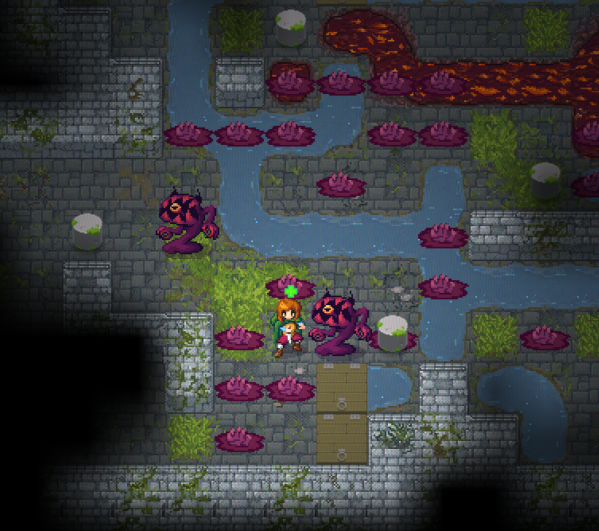 Re: Tangledeep: 16-bit roguelike dungeon crawler, 3 days left to hit KS stretch #3! I did play the previous build, I believe, but only have a few notes from that session; most I'll hang onto until I've tried the new build, I think. First, having the UI cover the corners of the dungeon is still a bit of a nuisance. To that end, a suggestion: simply extend the map outwards a little, filling it with whatever wall tiles edge the play-area at the point from which it's being extended. This might allow the camera to move the UI out of the play-area when the player approaches the edges of the map, without filling the screen with blackness. This build was the first in which I noticed the information regarding the summoned pet that's shown below the "extra turn" information. The health readout here is useful, I find! That said, the Floramancer's Floraconda is indicated to have "0 turns"--I presume that this is intended to show the duration of other summons, but looks a little odd here.